Maximum size: about 13 mm (estimated from photos). Identification: This species ranges from greenish-brown to yellow. 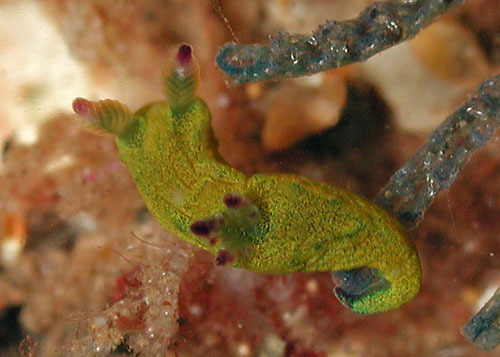 The rhinophores, gills, cephalic tentacles and foot are tipped with dark purple. Natural history: Martadoris amakusana is a moderately rare species found in moderately protected to moderately exposed rocky habitats and in Halimeda kanaloana beds at depths of 3-15 m (10-50 ft). When offered a piece of the blue bryozoan eaten by Tambja morosa, a young animal appeared to show feeding motions. Taxonomic notes: It was first recorded in Hawaii from Makena, Maui by PF on June 26, 1998 and was known as Tambja amakusana until Martadoris was erected by Willan & Chang, 2017. There's some question about whether the Hawaiian population is this species or Tambja kava. Photo: CP: 4 mm: Maalaea Bay, Maui; July 23, 2013.